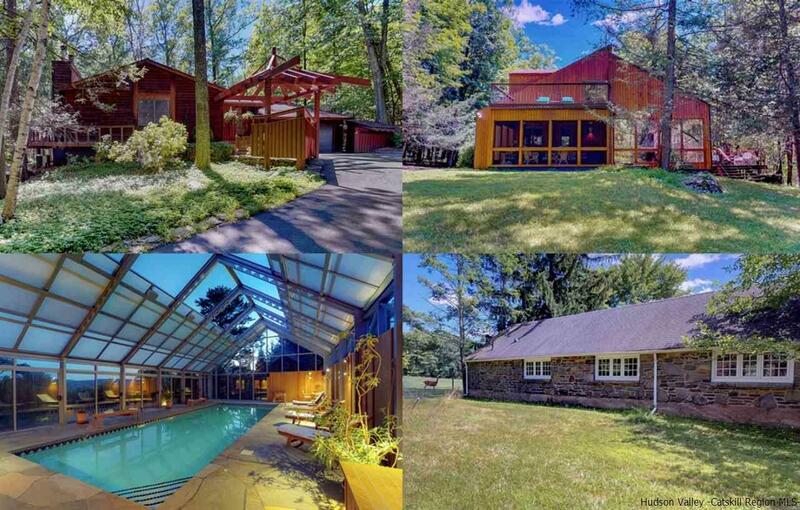 HUGHENDEN WOODS â A WOODSTOCK ESTATE There is only one Woodstock, NY--and there is only one Hughenden Woods. Whatever your needs, this gracious estate is likely to meet or exceed them. Create the ultimate family compound, exclusive corporate getaway or artists' retreat. Three stunning homes and a premiere sports complex total 10 bedrooms and 10 baths, indoor and outdoor tennis courts, indoor and outdoor Olympic size swimming pools and a club style bar/loungeâall spread across 23-plus acres comprised of 5 private, wooded parcels with mountain and valley views. This incomparable property has elegant details at every turn. THE MAIN HOUSE is built on three levels to iconic architect and artist Cary Cook's spec's and one-of-a-kind whimsical touches. A stately living room with beamed ceiling and fireplace is open to a true gourmet kitchen with high end appliances and exquisite imported Italian marble island and countertopsâan element also carried through to the bathrooms. Details like pounded copper sinks and mother-of-pearl stoppers surprise and delight. Step down into a four season sun room/workout room and separate game room. Now to the lower levelâanother world unto itself!âwith art gallery layout, state-of-the-art home theater and sitting room, master bedroom, open marble bathroom and additional office/drafting room. Back on the first level a few steps from the south-facing deck is a separate year-round studio, perfect for artists or yoga. THE GUEST HOUSE is renovated top-to-bottom with knotted cedar inside and out and more architectural flourishes. An open floor plan marries living room with kitchen and dining room and flows out to an expansive south-facing deck of its own. The first level is completed by two bedrooms including an en suite master. Up the dramatic custom cedar stairwell to the second level discover a second master bedroom suite with separate sitting room and additional outdoor deck. This level is open to the downstairs, allowing excellent natural light throughout. THE STONE HOUSE was recently updated to serve as offices, board room and common areas of a corporation, but can be converted back into a 3 to 5 bedroom dwelling. A library living room with stone hearth fireplace opens to an eat-in kitchen. Off the board roomâor formal dining roomâis a large office that can also double as a den, family room or master bedroom, complete with a 2nd fireplace. Three more rooms can all serve again as bedrooms, including an en suite master. Outside, enjoy the expansive lawns and mountain/valley vistas from the outdoor tennis court and salt water swimming pool with private changing cottage. BLACK ACRE â A sports complex featuring an indoor tennis court; two locker rooms, each with shower and sauna; office; kitchenette; and an old-school bar/lounge open to an indoor Olympic-size swimming pool surrounded by radiant heated stone with retractable roof above. Your favorite elixir at the mahogany bar or in front of the fireplace? A moonlit dip? You have arrived! And you may not want to leave. Not to worry, you don't have to â there's an efficiency studio apartment as well! Copy and paste https://www.halterassociatesrealty.com/hughendenwoods for more info, 3D photos & 3D virtual tours of this amazing property!